Hosted by Freshwater Fishing Hall Of Fame Legendary Angler Joe Bucher. While Joe is most widely noted today as a musky guru, his beginnings are deeply rooted in bass fishing. In fact, in his boyhood years he was locally known as a “teenage bassin’ wiz”. Throughout the 1970s, 80s, and 90s he was a full time walleye guide and also took clients on frequent musky trips. 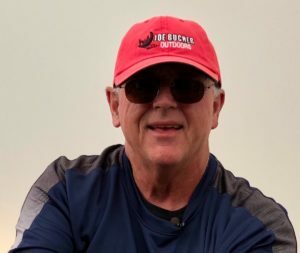 Being a prolific writer, Joe has authored six books as well regularly contributed writings for many regional and national publications on a wide variety of hunting and fishing topics. His articles regularly appear in the pages of Outdoor News Publications as well as Musky Hunter Magazine, which he founded. He has been a writer now for over 35 years with his first article published when he was just 19 years old! He has pioneered many of the musky angling concepts that are-now considered mainstream techniques, and founded Musky Hunter Magazine in the 1980s. Joe Bucher is still one of the most highly sought after seminar orators for big gamefish in the-country today drawing crowds of both fans as well as hard-core anglers anxious to learn more from one of the true masters of big fish. But let’s not forget that he also writes, produces and plays his own music instrumentals for his TV series. CLICK ANY SPONSOR ICON BELOW TO VISIT THEIR WEBSITE!